We are richly blessed to have great musical instruments here at the Walla Walla University Church. This week we consider our grand piano. The piano of the University Church is a Bösendorfer Concert Grand 290 Imperial. At nine and one-half feet (290 centimeters) in length, it is the largest, and perhaps most expensive, piano in production and comes equipped with nine extra bass notes not found on any other piano. Ignaz Bösendorfer founded the company in 1828 in Vienna Austria. Ten years later the company shot to fame when Franz Liszt selected a Bösendorfer for his Vienna recitals, and the firm remains one of the world’s preeminent piano manufacturers. We have spoken of this piano before, but at this time of year I always give special thanks for this instrument — let me explain why. We consider the stewardship of our instruments a large responsibility that requires more than routine tuning. To this end, once each year — in late August or early September — we bring a special piano technician from Seattle to tune up our Bösendorfer. Because it gets played so much, the piano’s action becomes irregular, the hammers become too hard, and the voicing becomes uneven. Addressing this requires the hand of someone very special. For the past seven years, we have appreciated the services of Bob Dillinger, the house piano technician for Seattle Symphony, Benaroya Hall, and Pacific NW Ballet. Last Sunday Bob again spent the entire day voicing and regulating our piano. He has noticed that, although the piano’s voicing slips during the wear and tear of the academic school year, year by year the piano is gradually improving as Bob continues to work on it. As Bob completed some final touch-up work on Monday morning, he and I agreed that right now our wonderful Bösendorfer is sounding better than it ever has. Therefore, it seemed appropriate to feature it in the prelude. Next week our attention will turn to pipe organs. To host a table, sign up in the lobby today, beginning at 10:30am. Peter Flores is a senior theology and music major at WWU who has extensive experience both as a two-year student missionary in the Pacific islands and, last year, as spiritual vice-president of ASWWU. Please join me in thanking Peter for sharing his talents with us. French composers of the Romantic period composed the service music for today, and these musicians had much in common. Gabriel Fauré (1845–1924) was 16 years old when he began studying piano with Camille Saint-Saëns (1835–1921), initiating a friendship that would last 60 years. Although Fauré never attended the famed Paris Conservatoire, he taught composition there and, in 1905, became head of the institution. Best known for his beautiful Requiem, Fauré also wrote much vocal music and piano music. Of these, critics generally consider the nocturnes and barcarolles most highly, and Nocturne No.6 in D-flat Major perhaps the best of all. Camille Saint-Saëns attended the Paris Conservatoire but never taught there. Having revealed his musical abilities at a precocious age, he was highly regarded as a virtuoso pianist, organist, and composer. Both composers served as organist of the imposing Church of the Madeleine in Paris, Saint-Saëns from 1858–1877 and Fauré from 1896–1905. we adore You! We believe! Today's loose offering contributions are for the ministry of the Seventh-day Adventist world church. Your gifts marked "tithe" specifically support pastors' and teachers' salaries. Gifts marked "University Church Budget" fund local ministry. Thank you for your generosity! 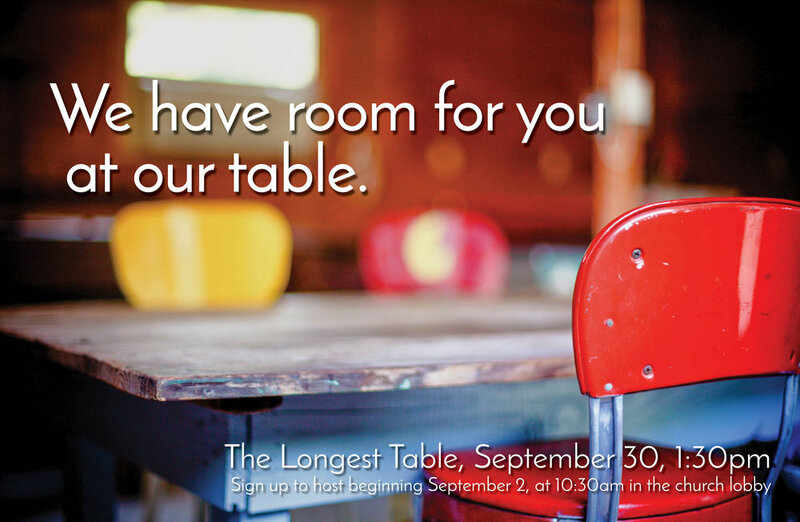 The Longest Table sign-ups begin Sabbath, September 2 at 10:30am and will continue each week until Sabbath, September 23. You can also sign up by calling the church office at 527-2800. Thank you for welcoming the WWU students at this event on Sabbath, September 30, following Second Service. Julianna Sayler’s Life Celebration will be held at the Walla Walla University Church in College Place, Washington on Monday, September 4, 2017 at 5:00pm. The service will be family friendly and have children’s activities. You are welcome to wear Team Julianna colors: Teal and Pink. In lieu of flowers donations can be sent to the Sayler family to help cover medical and funeral expenses. The church office will be closed Monday, September 4 for Labor Day. WWU Church Family Camping weekend is planned for September 8–10, at Harris Park Campground in Umatilla County, up the hill from Milton-Freewater. The full campground is being held for our members to reserve (RV sites with full hook-ups, 2 cabins, and spaces for tents are available). Sites will be released to the public however, if we do not call and specifically register individually. This gathering and any additional activities will be informally organized, with the exception of a family worship and group potluck to follow on Sabbath. Register by calling Cortney at Harris Park: 541.938.5330. Contact Sherrice Croft for details: sherrice.croft@wallawalla.edu. Church will continue on as normal in the Sanctuary. Our regular service schedule will resume with two services on Sabbath, September 16, with First Serve beginning at 9:30, Sabbath School at 10:30, and Second Service at 11:45. We will be welcoming Walla Walla University freshman and new incoming students on Friday, September 15 and Sunday, September 17at the residence halls with cookies. If you enjoy baking and would like to be a part of this special welcome please drop off cookies at Foreman or Sittner Hall anytime. For questions contact Renée Unterseher at (509) 527-2772 or renee@wallawalla.edu. As part of Adventist Community Services, SonBridge is working to help meet the needs of those affected by Hurricane Harvey. Call 529-3100 or visit SonBridge.org for ways to help Texas. The Christian Aid Center needs you! This important ministry partner of the University Church is always in need of volunteer help. In particular, the director of volunteers at CAC (and our church member), Jeannette Regalado, is requesting for help with chapel speakers (6:30pm daily), breakfast cooks (Sunday and Monday mornings), and van drivers to pick up donated food (Tuesday and Thursday mornings). Contact Jeannette at 509.525.7153. Buying school supplies? Don’t forget hygiene supplies! Having clean clothes and refreshed body is a great way to start the new school year. Your donation of body wash, shampoo, deodorant, razors and shaving cream help to refresh the body. Laundry pods and dryer sheets help to make sure clothes are looking great; small things like nail clippers, body lotion and hand soap keep everyone looking good. Bring buy your tax deductible donations to HELPLINE at 1520 Kelly Place, St 180, Walla Walla, WA, Mon – Fri 9:00-11:45am or 1:00-3:45pm. A receipt can be given upon request. The UCC Women’s Fall Retreat, Always, October 27 and 28, welcomes special guest, Janet Page, General Conference Associate Ministerial Secretary. Registration is available at UCC Women’s Ministries web page. https://www.uccsda.org/English/Women/Pages/Womens-Ministries.aspx. 1:30pm — Longest Table, 4th St.